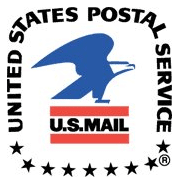 The United States Postal Service (USPS) was founded in 1971, replacing the United States Post Office Department. It is in Washington D.C. In the United States, it is referred to as "the post office", "the postal service", or just "the mail". Its job is to deliver letters, packages, and other items to people. ~ Benjamin Franklin ~ George Washington ~The First U.S. Postage StampsIssued 1847The first stamp issues were authorized by an act of Congress and approved on March 3, 1847. The earliest known use of the Franklin 5¢ is July 7, 1847, while the earliest known use of the Washington 10¢ is July 2, 1847. Remaining in postal circulation for only a few years, these issues were declared invalid for postage on July 1, 1851. United States Postal Service Facts for Kids. Kiddle Encyclopedia.